Protagonist is exactly what I need! If you are looking for a less traditional protagonist and someone more of an anti-hero, more along the lines of Lelouch (Code Geass) or Light (Death Note) then I recommend this! Short series but I enjoyed it mainly because Hyobu was so enjoyable to watch. I really want to see more MCs like this in the future! I really enjoyed this. The animation was great, the story was strong. after watching this, i went and found the original series, which was a little dated and weird but enjoyable. Now you get this show that is further down the timeline with more badass. The show has an amazing story and animation style, hard to find a good quality show these days that doesn't have to refer to nothing but sexual references. You build a great relationship with the characters, the show had me from the first episode which is rare for shows to have that effect on me. I decided to give this a try even though I normally wouldn't watch something like this. I am happy that I did though because I think this series is almost by favorite series that I have watched all the way through ever since I got into anime. A great anime that I hold the belief that anyone would be able to enjoy without finding all that much negative to say about it after watching it. The plot of this series was very interesting. I thought the whole idea of the storyline of this series was perfect. I am a sucker for the whole crooked government or military idea in any media type. I wish there were a few other anime with the same main idea for the plot here on crunchyroll. The characters of this series I loved. They all had unique personalities and they valued things that would make sense to anyone in reality. None of them were the type that would just let others walk all over them which was something that made me love them all just a little bit more. The setting of this series was interesting. I don't have any critiques either way because I think just watching this series would show you the best points to the series. The art, or the animation, of this series was good but I didn't really like it at some points. Maybe the use of the colors for the powers of the characters and some other things, they just didn't seem as if they were the best choice. I don't know, but the art of this series didn't keep the same scoring as everything else to this series. The sound of this series was almost perfect. I thought that the opening and ending music selections were well chosen along with the music pieces used in the background to enhance scenes throughout each episode. In all, the sound was one the best points to this series. This series turned out to be very enjoyable for me. I loved watching this series because of the plot and the characters. And, not to mention, the powers the characters held. This series wasn't really something that I would normally watch but I am glad that I did watch it. The plot had me riveted and I think that this series would be something anyone could enjoy watching, no matter what genre they are interested in or what genres they hate. This is one of those rare but wonderful cases of a spin-off surpassing the source material. 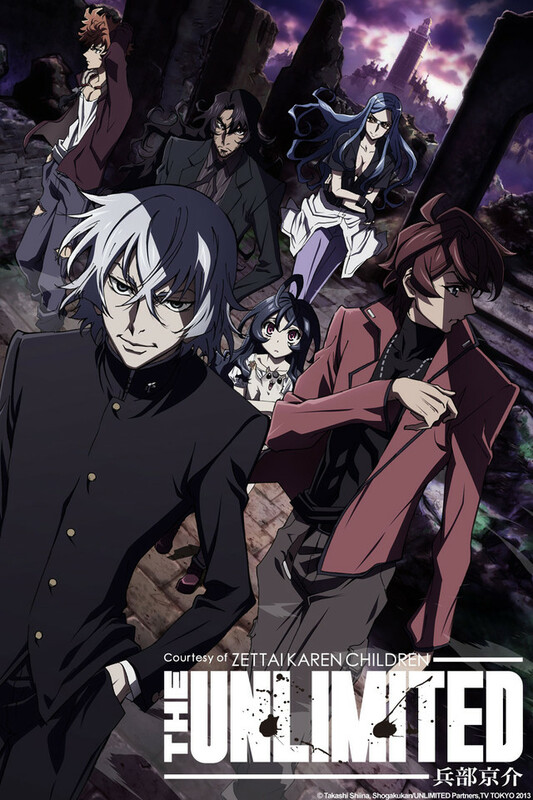 The Unlimited has appealing art, a plot that actually makes sense, the right dose of humor, and is simply much more intelligent material than Zettai Karen Children. To put it bluntly: it's a superior story. And here's the best part: it requires no prior knowledge of the original anime. Dive right in. HYOBU KYOSUKE - ONE OF THE BEST!!! When I started this show i thought it was good and was thinking it will be a letdown at the end, but as the episodes go on, it gets better and better. This anime is really executed to perfection.The characters are intersting, Have a good story, plot and the action is amazing!!!! I'l recommend this to anyone. I'm sure you won't be disappointed by the end of the series. Pretty good! Not perfect, but still. So, I don't know anything about Zettai Karen Children. I ran across this on CR at random and decided to give it a try. I'm really glad I did. Like others have said, it's basically Japanese X Men with Magneto as the hero. Some really good action sequences, a really likeable cast of characters. There are a few that I'm assuming came from the originating series that didn't get much development, but it didn't hurt this series. Some negatives that I haven't seen much mention of: A lot of the situations are pretty "Saturday morning cartoon" ish. I was left thinking "wait, if this guy would do that then this would be a non-issue" a lot of the time. Some of the fight scenes, especially toward the end, were just bad and poorly thought out. Plot armor is OP. BUT: I loved the characters and the overall story. Andy's arch especially resonated with me by the end. And, unlike a lot of short series' with this kind of epic scope, it ended satisfyingly. In short, The Unlimited is a fun and quite satisfying short series, if you can get over the sometimes poorly thought out situations and fights. This Is An Outstanding Show! I really like show. I was trying to find an anime to watch since all the ones I like are starting to end and this show is making the time go by so quick. It's a really awesome show, and it really caught my attention on the first episode. I wish there were more episodes though.